Charles Barkley was born on Feb. 20, 1963 in Leeds, Ala. Growing up, he played basketball at Leeds High School and was recruited by Auburn University. During his three years playing on the team at Auburn, he coveted the top spot in rebounding in his conference for all three years. After his junior year, Barkley was drafted during the 1984 NBA Draft as fifth overall pick to the Philadelphia 76ers. Barkley joined an amazing team of legendary veterans, including Julius Erving, Moses Malone and Maurice Cheeks. He began averaging 14 points and 8.6 rebounds per game during the regular season. During his second year on the 76er’s, he averaged 20 points and 12.8 rebounds per game, becoming the starting power forward, leading them to the playoffs. He was named Player of the Year by The Sporting News and Basketball Weekly in the 1989-90 season. He ended his career in Philadelphia with six straight All-Star appearances, in hopes of earning a ring on the Phoenix Suns in 1991. During the 1992-93 NBA Finals, the Suns played Michael Jordan on the Bulls, and while Barkley won the MVP Award that year, he still didn’t manage to complete his life goal and win a championship, retiring after the 1999-2000 season. Being an 11-time All-Star and five-time All-NBA First Team selection, Barkley is still considered one of the best players of his generation, even without the ring. He was inducted into the Naismith Memorial Basketball Hall of Fame in 2006 and remains the 23rd all-time scorer and 19th in all-rebounds per game. His career stats prove that he is the shortest player in NBA history to lead the league in rebounding, at 6’6. 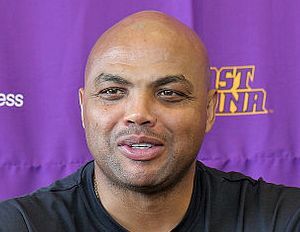 Currently, Barkley is an NBA analyst for TNT’s Inside the NBA, alongside Shaq, Kenny Smith, and Ernie Johnson.Â He has also written many socio-economic books, addressing the social issues of today, such as Sir Charles and Outrageous!